As somebody who runs a few sites I like to keep an eye on them and make sure they’re up and responding correctly. My go-to for years has been Pingdom but this year they gutted their free service so that you can now only monitor every 5 minutes. The free service with Pingdom wasn’t great to start with – limited alerting options and you can only monitor a single endpoint – so I went searching for something better as $15 a month to monitor a couple of personal low-volume sites is not money well spent. I’ve played with the Google Cloud Platform offerings for a while and like many others theirs includes a monitoring component called unsurprisingly Google Cloud Monitoring. Right now it’s in beta and is free and is based on StackDriver which was acquired by Google in 2014. I can imagine more integration and services will continue to come through as they have a complete product that also monitors AWS. 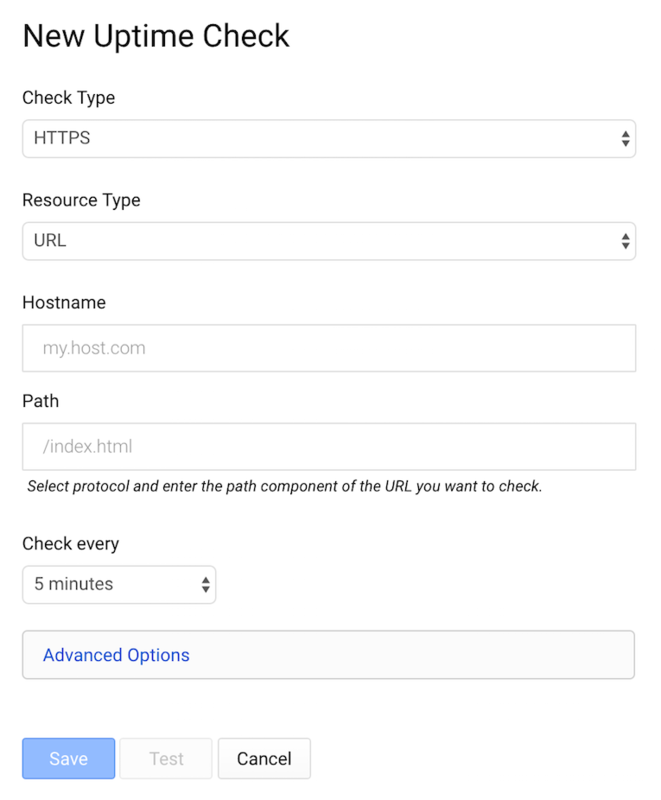 You can create HTTP/HTTPS/TCP/UDP checks and while it was designed to monitor the services you’re running on Google Cloud will happily take arbitrary URLs to services running elsewhere. Checks can be run every 1/5/10 or 15 minutes, use custom ports, look for specific strings in the response as well as setting custom headers and specifying authentication credentials. 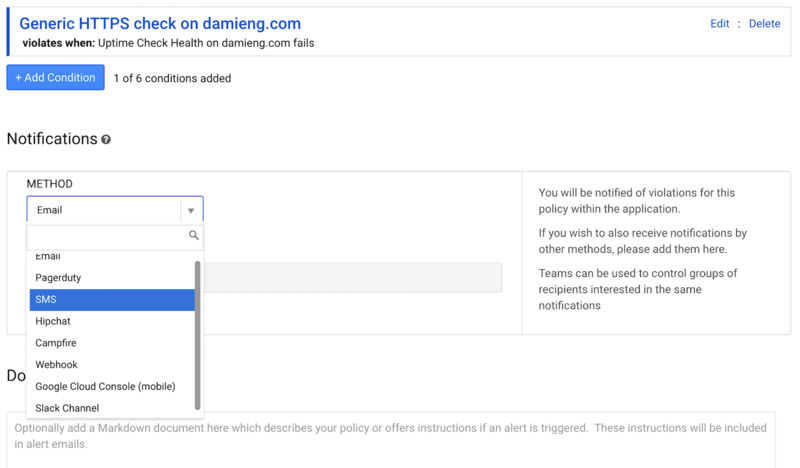 Here’s where Google’s offering really surprised me with alerting options not just for SMS and Email but also for HipChat, Slack, Campfire and PagerDuty and you can specify a number of them together and mix and match them with different uptime checks etc. Like Pingdom if the endpoint being monitored goes down an incident is opened that you can write details (comments) into and also like Pingdom it the incident is closed once the endpoint starts responding again. The cloud monitoring product has a configurable dashboard that like the rest of the product is really geared around monitoring Google Cloud specific services but there is an uptime monitoring component that can still provide some value. You can download the JSON for a graph, an API as well as iframe sharing functionality. I’m very impressed with this tool given the lack of limitations in a free product and will be using it for a bunch of my sites for now bearing in mind however that it has no SLA right now! Any other recommendations for free URL monitoring? I’ve been using UptimeRobot’s free offering for a year or two. http://aremysitesup.com is nice and has an app that alerts you on your phone.